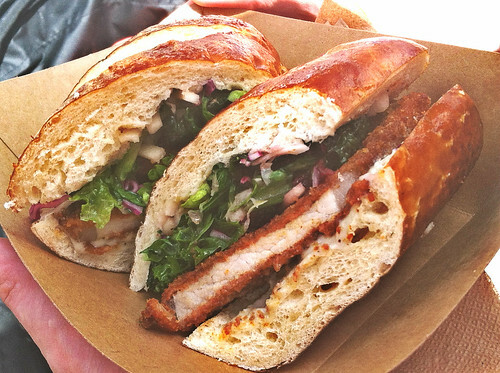 This pork schnitzel sandwich from the aptly named , Schnitz booth comes with gorgonzola spread, Schnitz greens and pickled cherries. Hello, gorgonzola and perfectly fried pork cutlet? Why has no one thought of this magnificent cheese/fried pork combo before?! I love getting a bite to eat at the Smorgasburg, but if you have a big appetite, it can easily get pricey. The Grumpy Russian is a good sized sandwich and a satisfying portion. At $9, it among the bang for your buck values and when we hit the booth at midday there wasn’t a huge line. I’m definitely looking forward to a return trip to try more of their schnitz!